PingOne: How do I use SSO Tracer, SAML Tracer, and Live HTTP Headers to Troubleshoot PingOne Issues? SAML Tracer is a Firefox add-on. 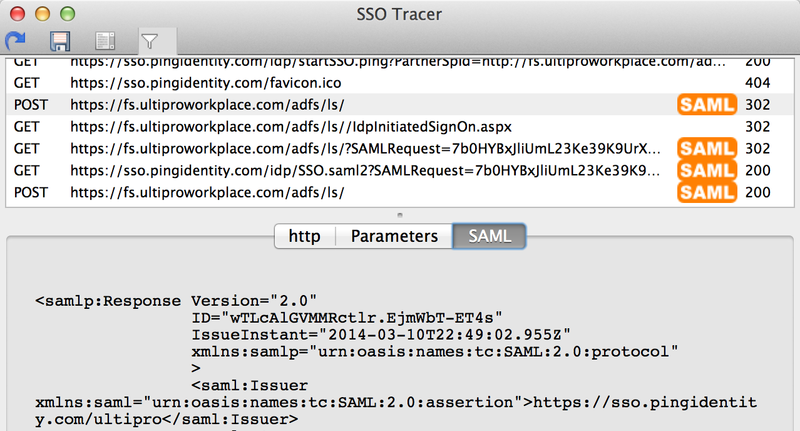 One can click Tools > Add-ons and search for SAML Tracer. This add-on allows one to debug and view SAML messages. After installing and restarting the browser one can click Tools > SAML Tracer. One thing that is nice about SAML Tracer is the http tracing lines that include SAML have an orange icon on the right of the URL in the top window. Selecting the line will cause all of the trace information to appear in the bottom window. Clicking on the SAML tab in the bottom window will cause the SAML message to appear. See screenshot. In SAML Tracer Autoscroll capability of the tracer can be turned on and off as necessary. There is also a Clear button that clears all visible information. There however is no export button so all information that one wants to export needs to be copied directly out of the Tracer. SSO Tracer is also a Firefox add-on. One can click Tools > Add-ons and search for SSO Tracer. This add-on allows one to debug, view, and export SAML messages. After installing and restarting the browser one can click Tools > SSO Tracer. Just like SAML Tracer SSO Tracer includes a button to control Autoscrolling and a button to clear the data as well. The SAML lines have a similar looking orange icon when a SAML message is present and a SAML tab in the bottom window. See screenshot. The most significant difference between SAML Tracer and SSO Tracer is SSO Tracer provides the user with the ability to export tracing data that is captured by it. This data can be sent to PingOne’s support team to further troubleshoot any issues. The file is saved as a text file. Live HTTP Headers is a third Firefox add-on. You can click Tools > Add-ons and search for Live Http Headers to find and install Live HTTP Headers. After installing Live HTTP Headers one can start a capture by clicking Tools > Live HTTP Headers. To save the captured traffic click the Save All button. Live HTTP Headers includes a replay button. Some steps of the SSO process can be replayed. Simply select the URL and click the Replay button. Another nice feature is on the About tab one can check for updates. To view a SAMLResponse with Live HTTP Headers, locate the POST to PingOne or the Service Provider and the SAMLResponse will be presented in the Headers tab. With all of the above add-ons please make sure to sanitize as needed before sending them to Ping.